Above: Submitted by Richard Kyaw from Brazil. This incredible fort was built from matchsticks in 1/72 scale. 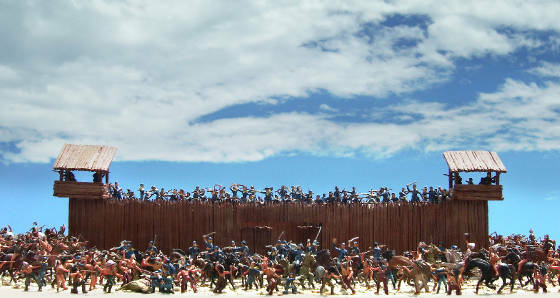 The figures comprise: 3 sets of Sioux (Imex), 2 sets of Union Cavalry (Imex), 2 sets of Indians (Revell), 1 set of 7th Cavalry (Waterloo-Atlantic reissue), 1 set of Custer (Nexus-Atlantic reissue), 1 set of Apaches (Nexus-Atlantic reissue) and 1 set of Cowboys (Revell).